Planning to pop the question at home? Here are some sweet ways to upgrade a marriage proposal at home. If you and your partner are the low-key types, then a marriage proposal at home might be absolutely perfect. 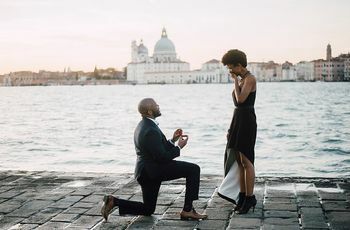 While any proposal is sure to be romantic, you likely want to make yours extra-special—even if you’re planning on popping the question in a relatively simple and casual way. From adding some décor to including loved ones, there are several ways to upgrade an at-home proposal, though your soon-to-be fiancé(e) will likely love it no matter what. Check out a few of our favorite ways to make a marriage proposal at home even more unique. You may be planning a super-low key marriage proposal at home, but empty pizza boxes and piles of laundry do not a romantic proposal make. Be sure that your house or apartment is clean before surprising your boo with a ring—you might even consider hiring a professional cleaning service to ensure everything is spotless. If your home is already is pretty decent shape, a little added décor can add ambiance, whether it’s twinkle lights, fresh flowers, or candles. If you and your partner live together, you’ll have to get him or her out of the house in order to stealthily clean and decorate. It may be worth letting friends in on your proposal plans so they can take your partner out for the day (under false pretenses, of course!) while you prep your place. Give a gift—yes, aside from the ring. While the engagement ring will likely be the biggest gift presented during your proposal, giving your partner a little something extra can make the moment even more meaningful. We’re not talking anything expensive or life-changing (although we do love a puppy at a proposal!). This gift could be a scrapbook filled with ticket stubs and photos or an item (like a mug or a Christmas ornament) inscribed with the words “Will you marry me?” If you’re worried about actually getting the words out, a gift that does the talking can be helpful. 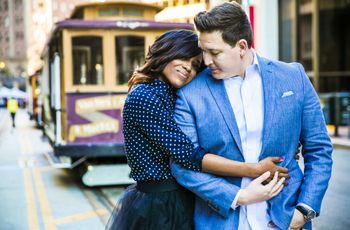 While a spontaneous marriage proposal at home can be quite romantic, it’s actually important to consider the timing before popping the question. If your partner is not in the best of moods, whether it’s due to a work crisis or being sick, it’s probably not the right time for a proposal—even if you think it might cheer him or her up. Also be aware of times when your partner is generally feeling tired or cranky—for example, if he or she isn’t a morning person—and avoid proposing at those times as well. If you think your partner would want to look his or her best when you drop to one knee, don’t propose when he or she is in PJs with messy hair. Wait for a time when your partner is generally feeling (and looking!) good and pop the question accordingly. The right music can really set the tone for an amazing proposal. Whether you and your partner have “a song” or not, create a playlist of some of your favorite romantic tunes to play in the background as you pop the question. If you’re not a music expert, you can find lots of proposal playlists online to help inspire you. Have your partner’s favorite food and drink handy. Depending on the time of day, consider including food in your proposal plan. If you and your partner have just returned from dinner, perhaps have a special dessert and Champagne on hand. Or if you’re proposing in the A.M., have the ingredients to whip up those amazing pancakes at the ready (or make brunch reservations!). Either way, a tasty treat can make a casual marriage proposal at home even more special! 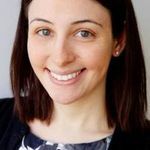 If you’re considering a marriage proposal at home, you and your partner probably value your privacy and want to enjoy those sweet post-proposal moments solo. However, it can be nice to celebrate your engagement with family members and friends, too. A proposal party can be a fun way to do so. 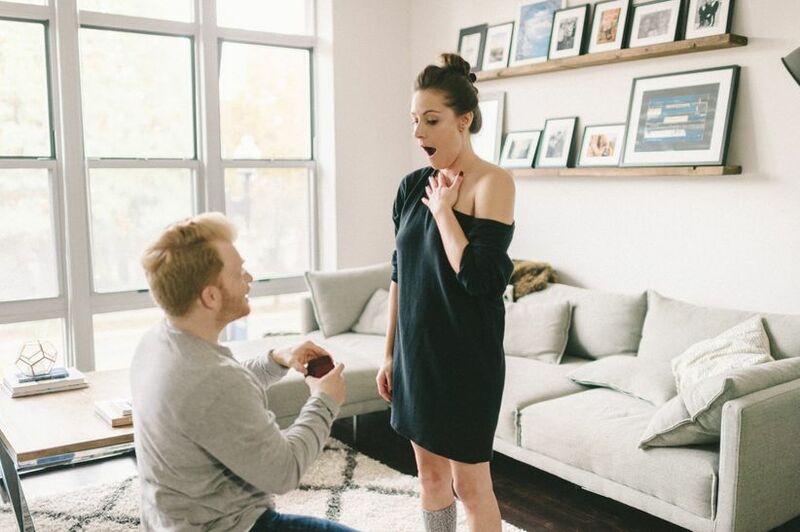 While many couples host a dinner or celebration immediately after the question is popped, that may not be your style—you probably don’t want dozens of loved ones descending on your house or apartment minutes after you proposed (or maybe you do!). Instead, plan a post-proposal brunch or happy hour in the days following your proposal.